IBM, HPQ, Cray, Pinnacle Data Systems, Teradata Corporation, and Silicon Graphics are the major five direct competitors which make up the diversified computer system industry. The industry also indirectly competes with specialized corporations-national and multinational (Yahoo Finance,2011). For instance, Dell, Acer, ASUSTeK, Apple, Accenture, Infosys, Sony Corporation, SAP, and Wipro, Oracle etc specialized companies in the product and service range of PCs, printing & imaging, data services, hardware devices, enterprise resource planning systems and operating systems etc. (HP annual Report, 2010). The global PC industry, which is expected to grow at a rate of 3.8% during 2011, is a major contributor to the diversified computer system industry’s growth momentum and sustainability (Gartner, 2011). The overall industry is facing the surge in competition due to recent consolidation efforts by major players in the industry. Furthermore, the industry dynamics are also changing rapidly as changing global demand and emergences of new technologies are putting pressure over industry players to aggressively compete in the price war. PORTER’S FIVE FORCES FRAMEWORK case study analysis has been undertaken to explore the current competitive rivalry in the diversified computer systems industry by specifically using the Porter five forces model. This study would also shed lights how HP by using porter five forces model better understand its competitiveness and build competitive advantage in the long-run. HP-Hewlett-Packard, having its headquarters in Palo Alto, California, USA, is a multinational information technology corporation operating in the diversified computer system industry. Being the largest technology company in the world in terms of revenue, HP is ranked 26 in the Fortune Global 500. Since 1986, HP has tried to emerge as a global technology firm by following acquisition-led strategy. Over the years, it has made a total of 116 acquisitions where its largest acquisition was its merger with Compaq, a PC manufacturer, in 2002 for the US $ 25bn. With this merger, HP was able to fetch market share of the personal computer market worldwide from Dell. Its product range comprises of PC’s, laptops, handheld devices, printing & imaging solutions, software, and enterprise solutions and data services etc. which are marketed to consumers, small and medium-sized businesses, large corporations, public sectors such as health, government, and education. The strength of the company can be witnessed from its USD 126.033 bn revenues and Operating income of USD 11.479bn during 2010 (HP annual Report, 2010). This study aims at developing a comprehensive Porter’s five forces framework of diversified computer system industry (HP’s industry). This research study will also assess the current state of competition in the industry. Attractiveness or unattractiveness of the industry will also be explored through this case analysis research study. The literature review will be developed by exploring secondary sources such as trade journals, academic journals, online databases, official websites, financial websites, annual reports, textbooks, and academic articles. Porter’s five forces framework, developed by Michael E. Porter in 1979, is a tool for industry analysis and developing business strategy. Industrial Organization (IO) economics is the basis on which this framework was developed to derive five forces that shape the intensity of the competition in an industry and therefore attractiveness of a market. In this context, the overall industry profitability is referred to as the attractiveness. If the combination of these five forces acts to drive down overall profitability, it results into an “unattractive” industry. “Pure competition” in an industry arrives as the industry approaches a very unattractive one. It is a market condition where profits for all industry players are driven down to zero (Porter, 1998). The three forces of the Porter’s five forces framework-threat of substitute products, the threat of established rivals, and the threat of new entrants- are from ‘horizontal’ competition, whereas the other two forces, the bargaining power of suppliers and the bargaining power of customers, are from ‘vertical’ competition (Porter, 2008). Keeping in view the sample size and the objectives of the proposed case analysis, an appropriate research strategy will be adopted. The researcher will explore theory in order to pay attention to previous research studies. He will also make use of deductive and exploratory approaches while utilizing relevant theories and competition analysis tools. Different research philosophies like positivism, realism, and interpreting can be used in this research study. Realism will be mostly followed by gathering industry facts and figures. However, interpreting will also be used to assess the industry experts’ views about the current rivalry in the industry. Most of the exploratory studies make use of this philosophy in order to clarify the basic concept of the research by taking some assumptions along with real information (Perry, 1998). The researcher will mostly rely on secondary data from trade journals, online databases, management articles, an official website of the industry players, annual financial reports, and financial websites etc. primary research will be conducted through using questionnaires and interviews to develop porter five forces model of HP (Perry, 1998). Questionnaires: Questionnaires will be administered during the second phase of the research study. These questionnaires will be presented to a relevant group through random and snowball sampling techniques (Saunders et al, 2007). Key informant interviews: In this phase, if the research studies, the research will conduct interviews with industry experts and managers at HP and its competitors in the diversified computer system industry. These interviews would enable the researcher to collect qualitative data and ascertain the experts’ opinions about the current rivalry in the industry. Moreover, research will also be able to identify the differences and similarities between the results of the questionnaires and experts’ views. The interviews will be conducted in semi-structured and informal format (Collis & Hussey, 2003). The sample size will vary according to the stages of the research study. Non-probability sampling technique will be used as subjective judgmental will be utilized to select the sample of the industry experts and managers at HP and its direct competitors (Saunders et al, 2007). Despite the fact that there are large numerous techniques in this method, the research will use purposive sampling technique. It is a technique to select those people whose opinions are relevant to an issue and worth obtaining (Collis & Hussey, 2003). Threats of established rivals: HP faces intensifying and fierce competition from some long-established firms and some rapidly growing new firms in the diversified computer system industry. The recent consolidation efforts by major industry players are changing the industry and competition in the industry. Moreover, HP as well its rivals are being forced to bring rapid innovation in their products and service due to short product life cycles. Now the forces of technology, performance, price, quality, reliability, brand image and portfolio of products and services are also changing the landscape of the industry. HP and its direct competitors are trying aggressively to compete on prices; however, the on-going consolidation seems to add to aggressiveness in the price war due to a reduction of development cost (IBM Annual Report,2010). Threats of New Entrants: HP faces huge threats from new entrants in the diversified and related industry, which has reduced its existing profit margins. Many new entrants have entered in the industry seeing the healthy prospects of diversified computer and related industries. It can also be observed that many specialized IT companies and global conglomerates are also planning to enter into PC, technologies, enterprise solutions, and data services. However, the complex and costly process of developing new high technology products and enterprise solution restrain the smaller, specialized IT firms to plunge into the industry. Threats of substitute products and services: HP faces somewhat low threats from substitute products and services due to maturing industry, shorter life cycles, aggressive price war, complex and costly processes of developing new products and services, strict laws of patent rights and decreasing industry overall attractiveness. Still, big diversified competitors such as IBM and other IT conglomerates can bring cost-effective and innovative substitutes in the market due to their strong R & D efforts and talented workforce. For instance, major Notebook and laptop manufacturer are increasing market share to small tech-pads and handheld smart devices such as iPad, Galaxy Tab, and iPaq etc (HP Annual Report, 2010). Threats of bargaining power of buyers: HP has to face strong bargaining power from its clientele comprising of consumers, small and medium corporations and large multinationals. The changing dynamics of buyers’ preferences and demand reflects the bargaining power in this industry where customers are seeking quality-oriented products and solutions at lower prices. Threats of bargaining power of suppliers: In the diversified computer system industry, Hp, as well as other market players, have to face increasing bargaining pressures due to the limited number of OEMs, commoditization of hardware components. For instance, Intel and AMD are the leading microprocessor manufacturers in the industry, thus they exert huge pressure over the PCs manufacturers. On the operating systems side, Microsoft still dominates the industry with its Windows Operating system (HP Annual Report, 2010). Porter, M.E. (1998). Competitive Strategy Techniques for Analyzing Industries and Competitors. Porter, ME. (2008). 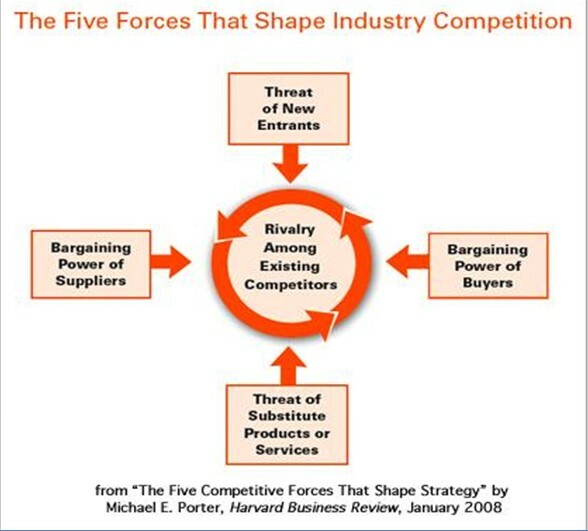 The five competitive Forces that shape strategy. Harvard Business Review.